Winter storms and blustery weather currently buffeting the Bering Sea have caused sea ice coverage to be reduced by almost 25% since late January. That’s according to climate specialist Rick Thoman. Thoman works for the Alaska Center for Climate Assessment and Policy (ACCAP) at the University of Alaska–Fairbanks. He says in the last two weeks, more areas of open water have popped up all around Western Alaska. The National Weather Service has issued winter storm warnings for multiple zones within Western Alaska over the last few days, including St. Lawrence Island, the Norton Sound coast near Nome, and Unalakleet. 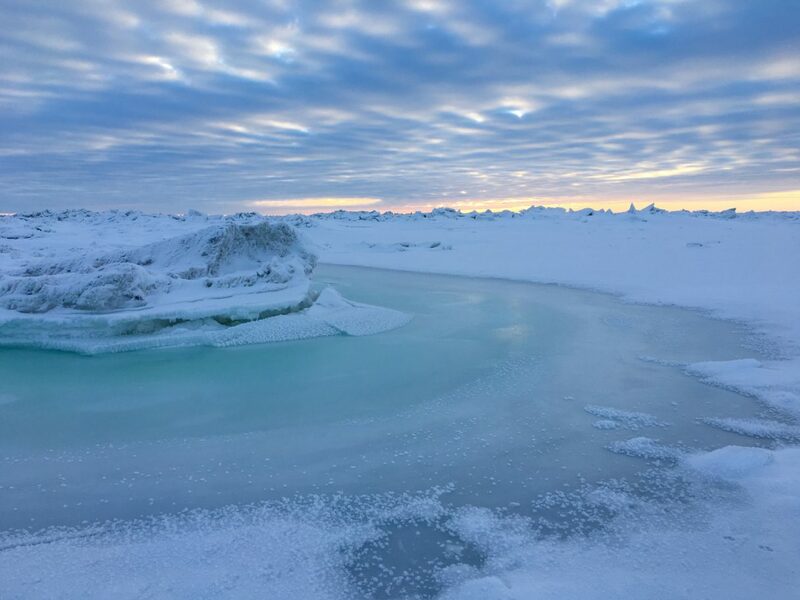 Thoman says due to these weather conditions, it could take some of the affected areas longer to re-form their sea ice than the Southern Seward Peninsula Coast will. Thoman adds that in Shishmaref, variable ice conditions could make subsistence hunting on the ice very challenging for the rest of February. Looking further north, Thoman says subsistence hunters will have to work around open water, a lack of thick sea ice, and mobile ice ridging together. For residents of Nome and other Bering Strait communities, Thoman recommends waiting for the storm to pass before going back on the sea ice. As sea ice extent changes dramatically in the Bering Sea, Thoman says it is always helpful to be vigilant and to report your observations. If you’re willing to share that information with Thoman or other weather observers, contact the local environmental network (LEO). Image at top: file photo: sea ice near Nome. Photo: Zoe Grueskin, KNOM.